The following setup instructions are for CCTV Camera Pros iDVR-E and iDVR-RT16 Series Surveillance DVRs. 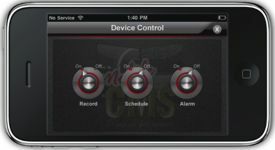 The iDVR-E4, iDVR-E8, iDVR-E16, and iDVR-RT16 DVRs are remotely accessible on iPhone and iPad using the Mobile CMS iOS application (Available in the Apple App Store). The Mobile CMS application comes in free and paid versions for iPhone and iPad. 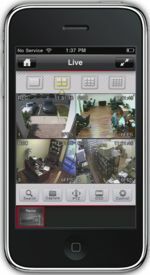 The free versions allow users to view all cameras connected to their DVR live from the app. The paid versions add the ability for users to not only view their CCTV cameras live, but to also playback recorded surveillance video on the iDVR from the mobile app, control PTZ cameras, and enable recording schedules remotely. 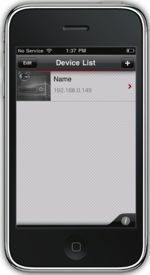 Another feature of both apps is the ability to store multiple DVRs for quick and easy access from anywhere. To access the iDVR-E remotely using the iPhone / iPad App, please follow the instructions below. These instructions assume that you already have a high-speed Internet connection (broadband) at the location of the DVR, such as DSL, cable, T1, or other. It is also assumed that your high-speed modem is either connected to a network router or that the modem is also a router and has multiple Ethernet ports. First, you must ensure that the correct ports are forwarded in your router. Please visit the Network Setup / Port Forwarding setup instructions page, then resume these instructions when that is done. Download the Mobile CMS Lite or Mobile CMS PRO application from the App Store. Go ahead and open the application. 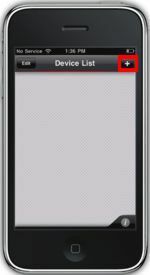 Enter the DVR's information by selecting the "+" button in the upper right corner. The menu below will appear. Once you have entered the DVR's information, press the Done button in the upper right corner. You will now be brought back to the home screen. To view the DVR, simply press the name on the list. You will now see your DVR live. NOTE: This feature only works on the paid version of the application (Mobile CMS PRO). 1. Press the Search button on the Live screen. 2. 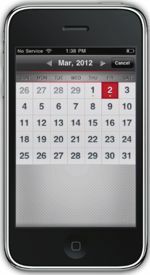 Then select the date you wish to view on the calendar. 3. Now select the desired time on the timeline. 4. Then press the play button on any channel to view your playback (Play is the three squares on the bottom of the screen). 5. You should now see the playback. NOTE: This feature is only available on the paid version (Mobile CMS PRO). 1. 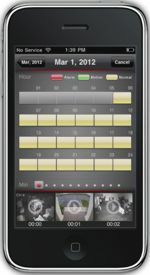 To enable or disable your recording, schedule recording or alarm recording simply press the Control button on the Live screen. 2. Then the menu below will appear. On this menu, you can either enable or disable your DVR's recording.